Have You Got A Leak? If the leaking pipe is found to be in an easy to access area then it can be more cost effective to expose and repair that particular pipe. Our specialist team assesses every swimming pool leak based on its own merit once located. Assessments are made based on disruption caused, access issues and any other remedial costs involved – our team then suggests the most cost effective route to repairing your leaking pool or filtration system. This pool had five leaks in total, three leaks on the pool and two on the spa. We successfully relined the entire filtration system, with no disruption to the pool or surrounding area. This saved our client thousands of pounds in rectification costs and the work was completed without disruption. We are extremely proud to be the first company in the UK to offer non-invasive, cost effective swimming pool filtration system relining. The service is carried out using bespoke equipment which has been especially designed for the relining of pipework with multiple 90 degree bends. 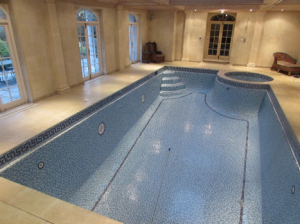 We are able to reline pipes around or even under swimming pools. Lining the existing brittle pipework with specially designed resin makes the pipe stronger than new – providing you with peace of mind for years to come! 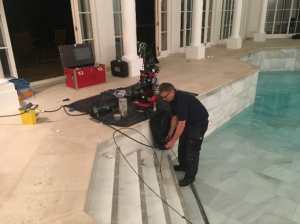 This method of relining system repair is most cost effective where remedial works could be very expensive – if you have tiled, marble or natural stone floor around the pool then the non invasive technique is likely to be the most effective & least disruptive method of repairing your leak. Remember this method require no excavation – so we can get to all pipes under your pool system! We will always be pleased to help! We created another non invasive success story at this clients home. We saved our client thousands by not removing this beautiful floor in order to gain access to the leaking returns by relining from the return outlets. If the damaged section of pipework is located under grass, paving slabs or block paving it is normally more cost effective to excavate, expose and repair. Once the team has located the exact location of your leak they excavate to the location, cut out the damaged pipework and replace it with new. The excavation is then backfilled before retesting your system for any further leaks. 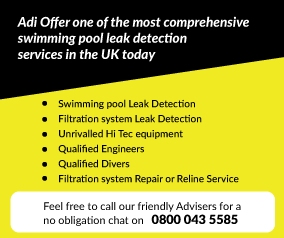 Here at ADI we guarantee to work with you to decide on the best and most cost effective solution for you before moving into the repair phase of your swimming pool leak. Please call us today on 0800 043 5585 to discover how we can help you locate and / or repair your swimming pool leak!